Type website URL, choose rule type (pass or block), choose an effective time section and type rule description, and press OK button. What is passing rule? Only allow user to access the appointed websites and block others. 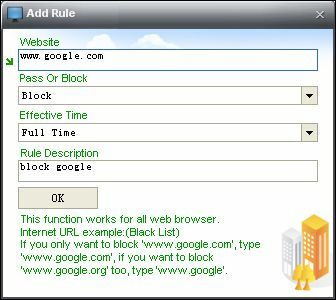 What is blocking rule? Only block the appointed websites. a) Choose passing rule in white list or choose blocking rule in black list. c) Click "Deploy To Agent". d) If you want to view remote computer's rule status , please click Internet -> Website Filter -> Get Agent Status. 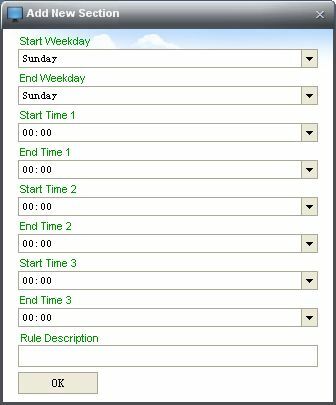 NOTE: if you want to create a new effective time section, please click Settings -> Time Schedule -> Add New Section. If user of the remote computer has opened one or more web browser, the alteration will not take effect until the user close all of the opened web browser.